Want to know what a blog tour is? 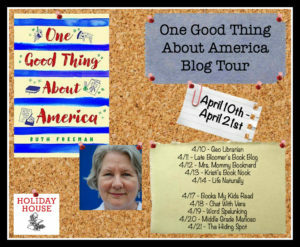 Come travel with me and my new children’s novel, One Good Thing About America, as we head across the country dropping in on 10 different blogs! Here are dates, blogs and topics. Have fun! 4/11 – Late Bloomer’s Book Blog – Is It Ever Easy Being New? My new book!A fourth grade door!